Moshe’s path as a martial artist started with his activities in the Jewish defense forces (1920-1930), long before Israel existed as independent state. The unhappy consequences of quarrels between Jews and Arabs on the suburbs of the old Tel Aviv – Jaffa lead Moshe to reconsider the training provided to the Jewish defenders. He was disappointed by the inefficacy of the young Jewish pioneers who were not able to defend themselves properly although they were trained in Jujitsu techniques. Moshe expressed his disappointment by declaring "I will make my own Jujitsu". And he did it. He analyzed self defense techniques and formed an efficient method of training. 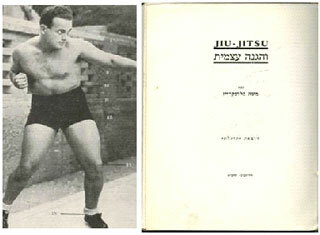 At the young age of 27, Moshe published his first book Jujitsu andSelf-Defense(1931) based on hisfighting experience. This book is the first Hebrew book of self defense. Jujitsu andSelf-Defensewas the catalyst for one of Moshe’s most significant milestones, the fascinating meeting with the professor Jigoro Kano, the founder of the Judo, in Paris (1933). Kano expressed great interest in the book and its author. During the meeting with Kano, Moshe demonstrated his unique technique for defending against knife stab. Moshe was captivated by Kano’s “Mind over Body” concept and with Judo as a vehicle for self development. He went on to become one of the first westerners ranked black belt in Judo. Attracted by this important milestone in Moshe’s biography, I began to research his fighting techniques. I was surprised to find that Moshe, at a young age, was already writing just like a master of martial arts. He explained not just techniques, but also considered the psychological aspects of fighting situations and principles of learning. I also realized that while Moshe was devising his own self-defense techniques and scientifically analyzing Judo principles, the foundations forthe Feldenkrais method were coming into place. 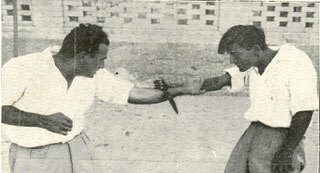 Moshe's practical activities in martial arts can be followed from 1920-1952 – in Israel, France and England. He was active in the French Ju-jutsu Club and reoriented the teaching of Ju-jutsu in France. When the Germans invaded Paris, he escaped to England where he continued to teach Judo and self defense and published his books Judo - the Art of Defense and Attack (1941), Practical Unarmed Combat (1942) and Higher Judo (1952). Jigoro Kano and the Japanese Judokas were very appreciative of Moshe’s scientific analysis of Judo. In the course of my research I republished the Practical Unarmed Combat. A new edition of Jujitsu andSelf-Defense(1931) is planned for 2010. In this seminar I share the fruits of my research with Feldenkrais Practitioners and Martial Artists. I present Moshe’s development as a martial artist and I show the links between this process and the development of the Feldenkrais Method. I teach some of Moshe’s unique self-defense techniques, so everyone will experience through his or her own body Moshe's ideas of self-defense and his fighting spirit. Using a selected group of ATM lessons I provide an opportunity to experience the synergy of Martial Arts and the Feldenkrais method. The combined presentation and training emphsizes the strong linkage between the essence fighting and survival and principles informingthe Feldenkrais method, as they were formulated by the genius while he was punching, choking, and throwing bad guys to the ground. This is a challenging training. I am sure that the seminar will provide meaningful ideas and practical tools for Feldenkrais Practitioners and to Martial Arts instructors. Fascinating and thorough, changed my view of FI. The material he brings together should be much more widely available. The historical info was fascinating, clear, and useful. Enjoyed the action packed length of the workshop. Moti is very knowledgeable, both in research and practice. The practical linkage of ATMs and self-defense were remarkable, clear, and useful. Wish the workshop materials were available as CDs and/or DVDs. Moti was concerned about giving too much material, but I enjoyed all of it. He has an enjoyable personality. I am very excited by all I learned in Moti’s workshop- a deeper understanding of FI work and also the skills to improve my Martial Arts. Instructor was very generous with his time and attention. Very focused on the need of the group. 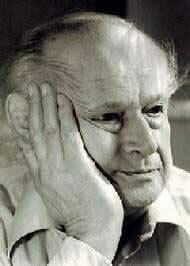 Presented helpful info for a more complete understanding of Dr. Feldenkrais and the roots of the Method. He was easily able to interface FI with MA (martial arts). I know many very experienced Martial Artists who do not have the understanding of this material. After 30 years of MA practice, not only did I learn new teachings but am in awe of Moti’s high knowledge of advanced principles. I would like more. I did not expect to participate due to elbow and knee injuries, but am very grateful Moti invited me to attend after meeting him at dinner. I feel more myself than any other time after my accident. This is a priceless gift.